This review aims to summarise the cardiovascular complications from cancer treatments and the methods used to prevent, identify, and treat them. While the field of cardio-oncology is relatively new, it is developing rapidly in the UK. There is a need to develop services to care for the patients with current cardiac problems, to undertake research and education to identify those patients at higher risk of complications, and to apply modern imaging methods and biomarkers to detect problems early and implement prevention strategies. An evidence-based approach is required to enhance delivery of care and prevent cardiovascular toxicity in this patient population. Advances in cancer care have nearly doubled survival rates in the past 40 years.1 Predictions from European centres2 indicate that there will potentially be a 7.7% and 3.3% drop in age-adjusted cancer mortality in men and women, respectively, during 2016. Much of this survival is in those with childhood and middle-aged cancers who are expected to survive into old age. This has led to the recent development of cardio-oncology as a recognised sub-specialty dedicated to the prevention, identification and treatment of cardiovascular complications in patients receiving cancer therapy and those who live as long-term survivors. This review aims to summarise the cardiovascular complications associated with cancer treatments and the methods used to prevent, identify and treat them in oncology patients. Cancer therapy may increase the lifetime risk of heart failure up to 15 times6 and is a prominent cause of iatrogenic heart failure. Highly toxic agents are administered systemically that directly impact on the heart. This effect is not limited to older chemotherapy agents, but also occurs with newer targeted therapies. Anthracycline cardiotoxicity was identified in the 1970s,3 and this drug class remains widely used in the treatment for both solid tumours and haematological lymphomas and leukaemias.7 Toxicity is dose-dependent and frequency depends upon the definition and duration of follow up. Historical studies reported a 3–5% incidence of decompensated congestive heart failure for doses up to 400 mg/m2 and 18–48% up to 700 mg/m2 of doxorubicin or equivalent.8 More recent studies report much higher rates at lower doses when reporting clinical heart failure or significant LVEF reductions e.g. 16.2% rate of CCF or LVEF reduction at doxorubicin dose of 300 mg/m2,9 and a large breast cancer study reported ~18% rate of LVEF fall of >10% and ~7% LVEF reduction of >20% at a cumulative doxorubicin dose of 240 mg/m2.10 Significantly higher rates of cardiotoxicity when asymptomatic left ventricular dysfunction or cardiac troponin elevation is reported. 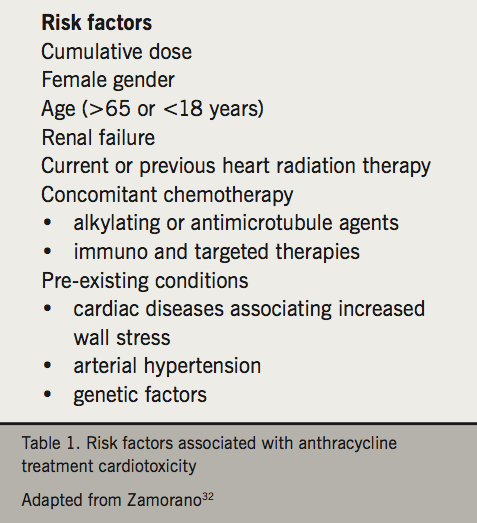 It is becoming increasingly evident that baseline patient demographics including age, gender, race, classical cardiovascular risk factors, prior cardiac history and previous cardiotoxic oncology treatments, will influence the absolute risk of anthracycline-induced cardiotoxicity (table 1). The role of genetic susceptibility is also relevant as some apparently low-risk individuals receiving modest anthracycline doses develop significant left ventricular impairment. The mechanisms of anthracycline cardiotoxicity are multi-factorial.7,11 Anthracyclines induce cardiomyocyte mitochondria to generate free radicals12 that cause structural cellular damage and apoptosis. A recent study has highlighted the role of topoisomerase 2 (Top2)7 in anthracycline mediated cardiotoxicity. Topoisomerases are required for DNA transcription, replication and recombination. Anthracyclines disrupt their normal function leading to DNA strand breaks, mitochondrial dysfunction and more free radicals. Within the human body there are two isoenzymes of Top2, Top2α and Top2β of which the latter is expressed in quiescent myocytes. Animal models of mice13 lacking Top2β are resistant to anthracycline cardiotoxicity. Dexrazoxane, an iron chelator, reduces the production of free radicals after anthracycline treatment and blocks the interaction of doxorubicin with Top2β. 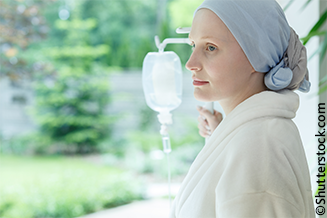 There have been conflicting reports about its efficacy and safety, but a recent Cochrane meta-analysis with longer-term follow-up confirmed that dexrazoxane reduced cardiac complications of anthracycline chemotherapy without increasing the risk of second malignancies.14 This has lead to a recent change in the EMEA license regarding the use of dexrazoxane in paediatric oncology patients. Several guidelines are available to monitor LV function and manage LV dysfunction associated with trastuzumab.19,20 This risk must be balanced against the risk of increased cancer recurrence without HER2 blocking therapy.21 Concomitant use of beta blockers during trastuzumab treatment has been observed to lower the risk of new heart failure,22 but this has yet to be confirmed in interventional trials. Over-expression of tyrosine kinases is a common feature in numerous cancers and, therefore, represents an attractive therapeutic target. However, a meta-analysis26 indicates that TKIs confer a three-fold risk of heart failure when compared with placebo. TKIs are proteins that when activated lead to phosphorylation of key substrates within a cell.27 When mutated they cause cell proliferation, angiogenesis and resistance to apoptosis. TKIs are designed to inhibit this but are non-selective between malignant and normal cells. Two main classes of TKIs have been licensed – BCR-ABL-targeted TKIs for chronic myeloid leukaemia (CML) and haematological malignancies, and vascular endothelial growth factor (VEGF)-based TKIs targeting solid tumours including metastatic renal cell carcinoma, sarcoma, gastrointestinal stromal tumor (GIST), hepatocellular carcinoma and thyroid malignancies. Imatinib, used in the treatment of CML, has been associated with heart failure,28 although this is rare (<1%). Imatinib induces apoptosis by blocking the BCR-ABL tyrosine kinase and disrupting the endoplasmic reticulum leading to an accumulation of misfolded proteins. In an animal model,29 myocyte ABL blockade appeared to be protective of cardiac dysfunction when imatinib was administered. It is possible to design drugs to avoid off-target effects but there is always a risk that this could reduce their efficacy in cancer treatment. Not all TKIs have been shown to cause cardio-toxicity,27 however, long-term experience with these drugs is limited and data on cardiac dysfunction are frequently collected retrospectively. Myocardial ischaemia can be induced with chemotherapy by various mechanisms including direct endothelial injury, vasospasm and adverse coagulant profile leading to increased risk of thrombosis. Patients’ cardiovascular risk factors should be managed using the same primary and secondary prevention evidence-based guidelines as the general population. Platelet inhibition can, however, carry an increased risk in oncology patients because of thrombocytopenia, surgery and direct bleeding from tumours.32 Decisions on pharmacological and interventional cardiovascular therapies in this situation can be challenging and should be discussed in a multi-disciplinary team meeting. Oncology patients are at increased risk of QT prolongation.4 Irrespective of chemotherapy prescription, cancer patients are prone to nausea, vomiting and diarrhoea that can cause unfavourable electrolyte imbalances. Concomitant prescription of anti-emetics, antihistamines, antidepressants and antibiotics (particularly macrolides and some antifungal drugs) is not uncommon in cancer patients and contributes to the increased risk. Arsenic trioxide, used as a second-line agent in acute promyelocytic leukaemia,35 leukaemias and myeloma, is exceptionally potent at prolonging the QT. Between 26% and 93% of patients have measurable increases in QTc, with 30% of patients suffering from a life-threatening arrhythmia. Vandetanib and lapatinib (TKIs) also prolong the QT interval with 4.3–8% and 6.1% of patients, respectively, extending their QTc >500 ms. Torsades de pointes is described in these groups, however, the exact incidence is unknown. Decisions to anticoagulate patients with cancer and atrial fibrillation can be challenging. Traditional risk scores (CHA2DS2-VASC and HAS-BLED), are a useful guide but have not been validated in cancer patients. Cancer is a prothrombotic state and there is much experience in anticoagulating this group of patients. Typically low molecular weight heparin (LMWH) is preferred, as the international normalised ratio (INR) can be labile. Novel anticoagulants have yet to be fully studied, however, subgroup analysis36 suggests a possible favourable profile compared with warfarin and heparins, although this requires confirmation. However, cancer patients may also have increased bleeding risks and thrombocytopenia may be an issue, presenting the same challenge as in ischaemic heart disease. Radiotherapy has been linked to increased cardiovascular risk (figure 1a–c). While the myocardium was initially thought to be relatively insensitive to the effects of radiotherapy, the vascular endothelium is particularly radiation sensitive,37 with capillaries and small arteries being the most susceptible to damage. Larger arteries are less vulnerable, but when damage does occur it can potentially be fatal. Radiotherapy for head and neck cancer confers a greatly increased risk of stroke.44,45 At 15 years the absolute risk of ischaemic stroke is 12%. Angiographic comparison46 of these lesions compared with non-radiotherapeutic field lesions indicates that they are typically longer and taper to maximum stenotic point at the end of the lesion. Management of this vascular damage can be difficult. In vitro study of human endothelium indicates that statins improve the inflammatory and thrombotic profile and would support trials of their use in vivo.47 Comparing percutaneous intervention versus endarterectomy for traditional carotid atherosclerotic lesions indicates non-inferiority of percutaneous intervention;48 this combined with the knowledge that previously irradiated areas are surgically challenging due to fibrotic changes further supports percutaneous approaches in this population. There is a lack of universal agreement on the most appropriate prospective cardiovascular screening strategy in oncology patients, especially when they are receiving newer agents.49,50 Several imaging modalities are used, with echocardiography the most commonly used for surveillance in patients receiving treatments putting them at risk of LV dysfunction. The most common measure of LV function is the ejection fraction (LVEF). Consistency on the method used to determine LVEF is crucial and Simpson’s biplane method is the recommended technique for 2D imaging. 2D imaging techniques however are only capable of detecting changes in LVEF greater than ~10%,51 therefore, smaller but significant deteriorations in LVEF may not be detected using this method. A decrease in LVEF of >10% to a value <53% has been proposed as a definition of cancer therapy-related cardiac dysfunction.52 Various protocols are suggested depending on the resources available at each individual institution. Indices of ventricular strain, such as global longitudinal peak systolic strain (GLS), appear to be more sensitive and specific predictors of early cardiotoxicity than simple measurement of LVEF. An 11% decrease in GLS, measured using speckled tracking echocardiography (STE), has a sensitivity of 65% and specificity of 94% for later cardiotoxicity.53 GLS combined with traditional biplane methods of determining LVEF has a beneficial net reclassification index (0.77, p=0.036). This places 48% of patients, previously categorised as low risk but who in practice suffered cardiac events, into the higher risk category while subsequently downgrading 29% of patients classified as high risk into the low risk category. Echocardiography also offers evaluation of all elements of cardiac function, including diastolic function, right ventricular function, valvular function, atrial dimensions, pulmonary artery pressure and pericardial disease. Limitations of echocardiography can include reproducibility, poor acoustic windows in up to a third of patients, particularly if recent left breast or chest wall surgery; obesity or chronic lung disease. Discomfort for oncology patients post-surgery, left chest radiotherapy with skin complications and rib metastases are further difficulties for echocardiography in this patient cohort. Echocardiography is relatively cheap and widely available in UK hospitals. The protocols can be adapted for surveillance in oncology patients, for example, undertaking a detailed baseline echo according to British Society of Echocardiography (BSE) guidelines with follow-up scans focused on aspects of specific concern, e.g. LV function, thereby shortening the scan time and increasing both comfort for the patient and flow of patients through the service. Cardiac magnetic resonance (CMR) imaging has been shown to be superior to echocardiography in assessing changes in ventricular dimensions and function.54 It is highly reproducible, an essential requirement in the follow-up of this specific patient group. There is also the benefit of not subjecting patients to further ionising radiation when compared with nuclear techniques. Beyond determining dimensions, CMR can detect the tissue changes of oedema, inflammation, scarring and fibrosis, all of which can occur in relation to cancer therapy.55 Currently, cost, scan duration and availability prevent its widespread use in these patients. The use of radionuclide angiocardiography has been established in many oncology centres for the serial assessment of LVEF.56 There is a high degree of reliability and reproducibility when compared with echocardiography,57 but exposure to additional radiation is a concern, especially when non-irradiating alternatives are available. Where high quality reproducible echocardiography is not available, multigated acquisition (MUGA) may still be considered, but echocardiography has clear advantages. hsTrop elevation from baseline in those treated with chemotherapy has been shown to identify patients at increased risk of cardiotoxicity. Detection of increased hsTrop I post-trastuzumab cycle has a hazard ratio 22.9 for heart failure.19 When combined with GLS, the overall sensitivity is increased to 93% and a negative predictive value of 91% achieved. It is likely that evidence-based guidelines for the serial measurement of hsTrop will be developed. Furthermore, the ease of obtaining hsTrop values from a standard blood sample, its universal availability and low cost of the assay combined with its high reproducibility suggest that systematic use of hsTrop may well prove to be cost-effective. There has been a rapid growth in the field of cardio-oncology in response to the growing efficacy and long-term survivorship achieved by modern oncology. In response, the International Cardio-Oncology Society (http://icosna.org) and Canadian Cardio-Oncology Network (http://cardiooncology.ca) have been formed and, in the UK, the British Cardio-Oncology Society was created in 2014 (http://bc-os.org). The Global Cardio-Oncology Summit was hosted in London in September 2017 (see www.bc-os.org). The new Cardio-Oncology Journal is into its second volume. A cardio-oncology training programme, based on the US training model, has been proposed,58 including two weeks’ exposure for medical students, one month for residents and a year for cardiovascular and oncology registrars. The recent position paper from the European Society of Cardiology (ESC)30 provides information and opinion regarding the multiple facets of managing cardiovascular problems in oncology patients, while acknowledging that it is not a formal clinical practice guideline. 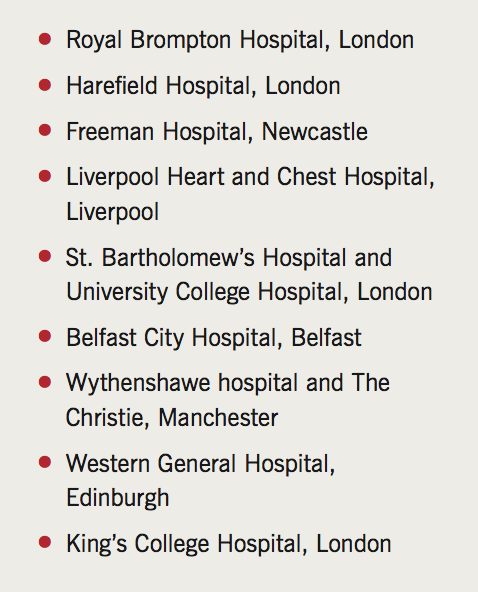 Within the UK, dedicated services are currently offered at the Royal Brompton Hospital, Freeman Hospital in Newcastle, Liverpool Heart and Chest Hospital, UCLH and other centres (table 2). A recent survey,58 indicates that two-thirds of surveyed hospitals in the US are adding cardio-oncology services to their roster. The field of cardio-oncology is relatively new but developing rapidly in the UK. There is a need to develop services to care for the patients with current cardiac problems, to undertake research and education to identify those patients at higher risk of complications, and to apply modern imaging methods and biomarkers to detect problems early and implement prevention strategies. An evidence-based approach is required to enhance delivery of care and prevent cardiovascular toxicity in this patient population. JB: no conflict. AL: none declared. CP has received honoraria for speaking at educational meetings or advisory boards from Amgen, Ferring, Novartis, Pfizer and Roche. SR is on the advisory board for Clinigen, the manufacturer of Cardioxane. K-KS: no conflict. 1. Cancer Research UK. Cancer Survival Statistics. Available at: http://www.cancerresearchuk.org/health-professional/cancer-statistics/survival#heading-Zero [accessed 25 August 2016]. 37. Fajardo LF, Berthrong M. Vascular lesions following radiation. Pathol Annu 1988;23(Pt 1):297–330.